We are very pleased with this show and appreciate being recognized by Mr. McGlynn and The Brooklyn Rail. Don’t miss The Internal Machine closing reception, complete with a Roundtable discussion as well as a performance. Find the details here. Please read Mcglynn’s review here. 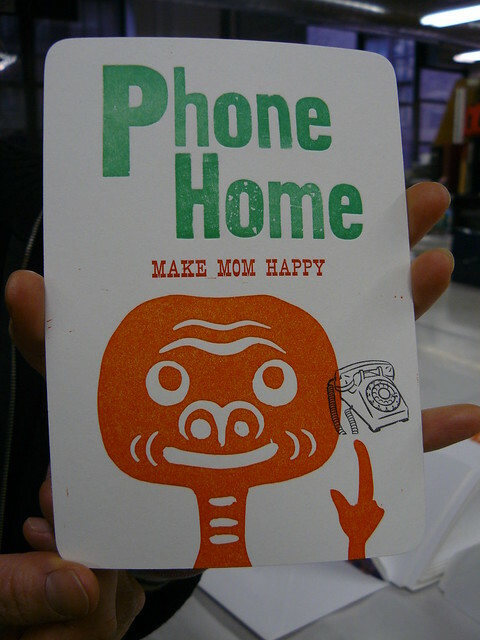 The Center for Book Arts had a great week enjoying New York’s Print Week. We enjoyed openings at MoMA, the Fine Art Print Fair, and the E/AB Fair. What a whirlwind! We were glad to see prints in the spotlight. One of our residents, Maria San Martin, exhibited work at the E/AB Fair through Booklyn. You can find her work here, and more information about Booklyn here. The Center for Book Arts was asked to be featured as part of a Skillshare video. 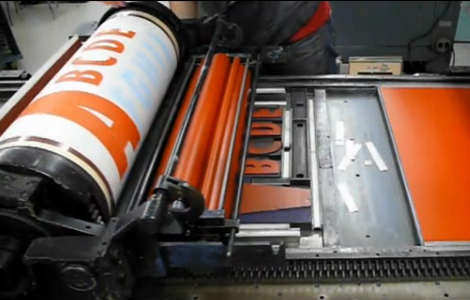 Skillshare needed footage of a printshop as well as metal and wood type. We were happy to accommodate and are quite impressed with the final video. Feel free to watch it here. See if you can spot us! Skillshare is a great resource and so are we! Learn Letterpress Printing, Book Binding, Hand Lettering, Papermaking and more at The Center. Explore our class offerings. Feeling Pressed? Try a Printshop Class! We strive to provide beginning students and professional artists alike with a comprehensive and technically challenging program of classes. Whether you’re a beginner looking to give printmaking a try, or an experienced artist trying to expand your skill set, the Center has an assortment of printmaking classes and workshops to suit a wide variety of needs. Take a look at our comprehensive class list, or keep reading for a sample of our current offerings. 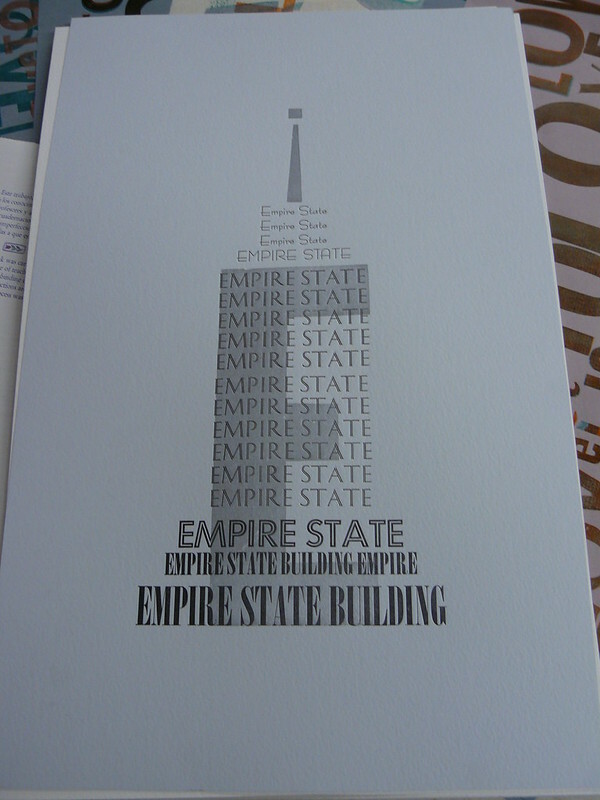 Looking for a taste of letterpress printing? Not sure if you want to commit to a whole class? Try Intro to Letterpress, an introductory workshop for those who want a sample-sized introduction to letterpress printing. 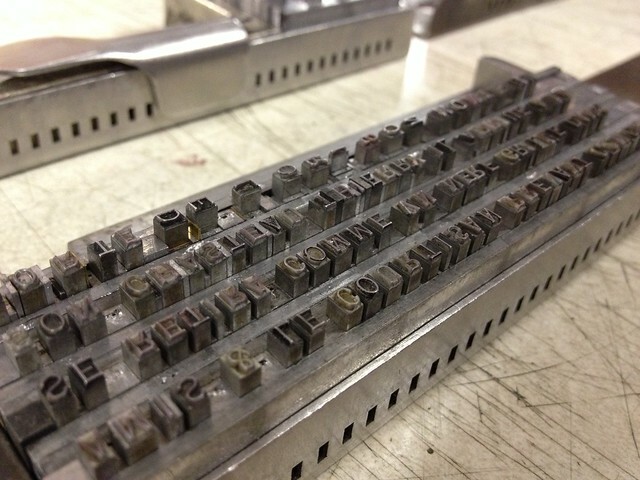 This weekend workshop covers basic typesetting and press lock-up, ink mixing, and press mechanics. Students will complete the workshop with a new understanding of printing and a small edition of their very own cards. Intro to Letterpress: Business Cards runs from June 29-29 (Saturday and Sunday), from 10am – 4pm. Letterpress I is a prerequisite for renting in the print shop at the Center, and is a required course for our certificate program. Letterpress I: Hand Typesetting is a great way to dive right in. This is a core foundation course that covers the essentials of good press work, including inking, imposition and impression. Students will have access to the Center’s collection of lead and wood type in learning basic hand typesetting and letterpress printing. Discussions include typefaces, paper, incorporating illustrations, and adding color. Throughout the course, students will gain fundamental print shop skills and develop their own small composition (such as a greeting, business or postcard), and may even complete a second project with time permitting. 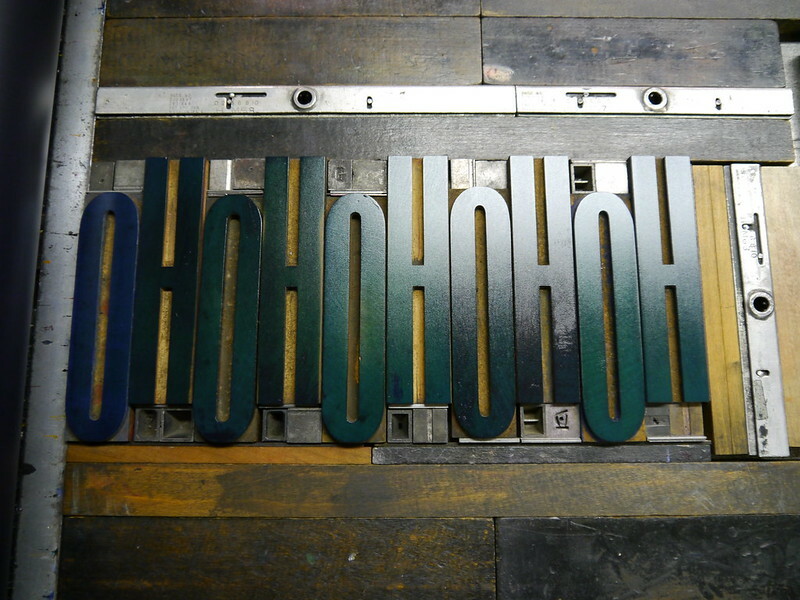 Letterpress I: Hand Typesetting runs from June 16-20, Monday through Friday, from 10am – 4pm. For those with some letterpress printing experience, Letterpress Lab is a great way to learn more about printing while creating work. Letterpress Lab is great for those looking for specific skills to complete a project, or simply looking for a refresher course. Over five weekly sessions, students will also get advice and printing tips on their own personal projects. 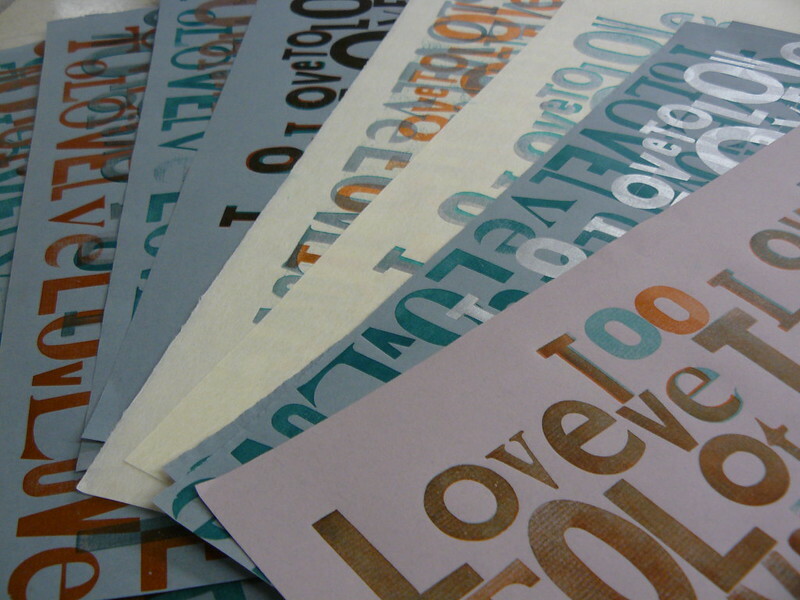 Letterpress Lab runs on Thursdays, from June 19- July 17, 6pm – 9pm. The Center is excited to announce a new print workshop, Printmaking on the Vandercook! Explore the Vandercook’s full range of potential with various materials, create layered prints using pressure prints, monoprints, and brayers to add splashes of color. Students will leave the class with a range of alternative printing techniques and a stack of prints. Printmaking on the Vandercook runs June 21-22, Saturday and Sunday, from 10am – 4pm. These are just a few of the classes currently available at the Center. Check out our comprehensive class list for more information and to register for classes! Lynne Avadenka, a visual artist, printmaker, book maker, conceptualist, realist, rooted in tradition and modern, is a Artist Member of the Center for Book Arts and a participating artist in the auction that coincides with the The Center’s 2014 Benefit “Forever 39” being held on April 4th. Lynne Avadenka has a deep respect for, and close relationship to, books. Her passion toward books includes an ongoing thoughtfulness and inquiry as to what constitutes the book, its structure, essence, and the experiential nature of its form. She creates limited edition works that combine text and image with a wide variety of printmaking techniques. Ms. Avadenka’s work is exhibited widely and is in the permanent collections of the following institutions: The New York Public Library, The Jewish Museum (NY), The Detroit Institute of Arts, The British Library (London), The Israel Museum (Jerusalem), and The Library of Congress. Most recently, she was a Visiting Fellow of the University of Michigan Institute for the Humanities, and a Visiting Artist at Susquehanna University in Pennsylvania. She has received individual artist grants from the National Endowment for the Arts and the Michigan Council on Arts and Cultural Affairs. In 2014, she has been awarded an artist residency at the Gottesman Etching Center at Kibbutz Cabri, Israel. To learn more about her piece in the auction, browse and bid on any of the work, you can visit the preview here. To view Lynne Avadenka’s art and to learn more about her, visit her website. Curious about letterpress printing but not sure where to start? Wondering if letterpress printing is up your alley? Get your feet wet in this series of introductory workshops. You will learn basic typesetting and press lock-up, ink mixing, and press mechanics. 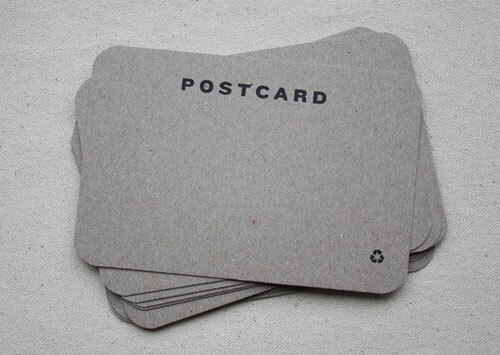 Produce eye-catching letterpress postcards, while learning the essentials of good presswork. This postcard sold for over $1000! souvenir-y postcard was created in Britian in 1871, and the form increased in popularity after postcards were made to show the newly-constructed Eiffel tower. And, of course, the French also created postcards with naked women around this time. So take your part in history and begin learning how to use the presses on March 15th and 16th from 10am to 4pm by signing up for Intro to Letterpress: Postcards! No! Keep reading! This totally applies to you too! I recently went down the rabbit hole of wedding blogs (I’ll explain why in a minute), and I learned something: weddings can be really expensive y’all. And if you don’t want to carve out your own sliver of the pie that is the billions of dollars spent on weddings each year, a great way to cut costs while personalizing to the max is to create and print your own wedding invitations. And the process got even more cost-effective because the center is offering a two-for-one-deal, so you can bring your fiance with you to test the strength of your relationship over color, type, and paper choice. There’s no couples therapy as effective as seeing if you can work a press together! Of course, if you’d rather bring a friend, family member, or stranger off the street, that’s ok too. Participants will learn to handset their invitation using our collection of metal type and ornaments, or will use their own digital design to print from polymer plates. In these sessions, everyone should be able to print 100 one-color invitations with rsvp and envelope. If the design requires more time, we have supervised rental hours after the class is over. Want to give us suggestions or comments? Just want to say hi? Comment on this post, email us at info@centerforbookarts.org, visit us on Facebook (/centerforbookarts) or follow us on Twitter (@center4bookarts). Can’t wait to see you there! A writer! She’s thinking about her application! Writers! All writers! Your attention please! This is so exciting! You’ll never guess! and printing on the letterpress. And the best part is: it’s all for free! Workshops on letterpress printing: traditional and with technology! and call the mail coaches! The application deadline quickly approaches! The Center for Book Arts invites applications for our Letterpress Publishing Seminar for Emerging Writers. The next session of this workshop is scheduled for the fall of 2013, dates November 6-10. The seminar is tuition free for participants and includes the cost of materials. Those selected must attend the entire five-day workshop. Participants will hear lectures from various professionals in the field – printers, fine press publishers, book artists, and dealers, to get a practical overview of letterpress printing and small press publishing. They will learn the basics of letterpress printing, both traditional typesetting and options with new technology, by collaboratively printing a small edition of broadsides. This workshop is most suitable for those with little to no previous letterpress experience. Each seminar will be offered to a maximum of eight students. Writers from culturally diverse backgrounds are especially encouraged to apply. Application Postmark Deadline is October 1, 2013. Excited about applying? Have a poem to share? Want to give us suggestions or comments? Just want to say hi? Comment on this post, email us at info@centerforbookarts.org, visit us on Facebook (/centerforbookarts) or follow us on Twitter (@center4bookarts). Can’t wait to see you there! Holy donations, Batman! The Center has just received a generous donation of type from Mike Westfall, CBA’s Hero of the Week (copyright, me)! We are all supremely grateful for his incredible gift and are eager to sort, store, and use the type as soon as possible. Through donations like these that the Center is able to continually expand and improve our type selection. Among the most exciting new additions are several boxes of Consort (italic, light, and bold) and Grotesque No. 9 and 10. Grotesque types, as you undoubtedly recall from our past post on the subject, were the first sans serif faces. Additional boxes contain Copperplate Gothic, Century Schoolbook, Granby, and many more. And the best part? The type is all unused, in perfect condition. After decades of hanging around in boxes, waiting, just waiting, for someone to come along and help it fulfill its life purpose, the type will finally be placed in a press. And you could be the person who finally infuses this type’s life with meaning! So sign up for an upcoming section of Letterpress I or come to supervised printing and make a difference! Looking for a new skill? Want to try letterpress but don’t have a lot of free time? Take a week off this summer and register for our August Letterpress I Hand Typesetting workshop, the week of August 19-23. Getting your hands dirty has never been so much fun. Learn all about serifs, wood versus metal type, imposition, registration, the basics of printing on a Vandercook proof press, and more. Amaze your friends with your new-found typographical knowledge. Communicate with your friends via the printed word and outfox the spying eyes of internet retailers and the US government. Send you Mom a Birthday Card, she deserves it! Send your sister a thank you card, she’s your sister for god sakes! Start handing off your business cards to attractive strangers with aplomb! Join us the week of August 19 – 23 , Monday through Friday, 10am – 4pm. The incomparable Roni Gross will be your guide to the world of hand typesetting, ink, paper, and printing.presses. You’ll learn the essentials of good presswork, including inking, imposition and impression and move on to discuss typefaces, paper, incorporating illustrations and adding color. You’ll come away with an edition of your own design. What do you want to say? Bring words and ideas to class and be ready to roll up your sleeves.Register here. Want to give us suggestions or comments? Just say hi? Comment on this post, email us at info@centerforbookarts.org, visit us on Facebook (/centerforbookarts) or follow us on Twitter (@center4bookarts). Can’t wait to see you there!